Half of voters oppose allowing states to opt out of certain protections for people who have pre-existing health conditions, rejecting a key concession that House GOP leaders made to win over conservative hardliners on their health care bill. 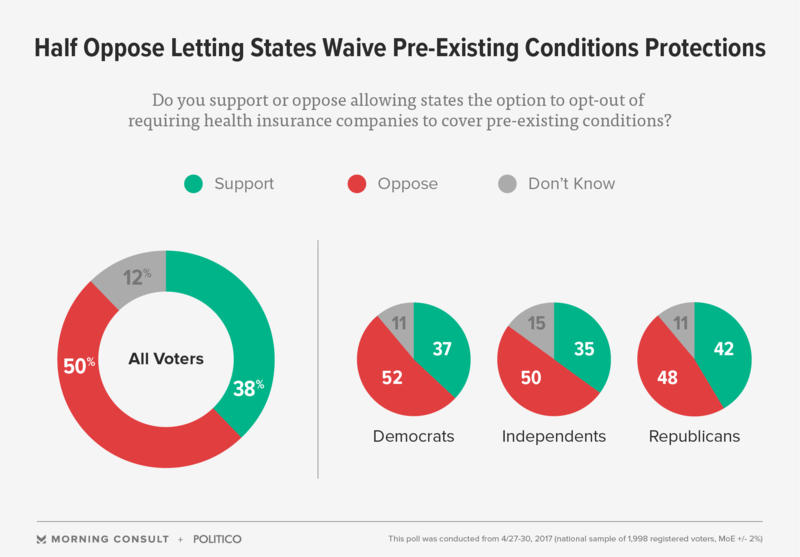 In a new Morning Consult/POLITICO poll, half of voters said they oppose enabling states to waive a federal mandate that prohibits insurers from charging higher premiums for people with pre-existing conditions. By contrast, 38 percent of voters said they back the proposal, which would only let states apply for a waiver to opt out of the popular Affordable Care Act provision if they participate in a federal risk-sharing program or establish a high-risk pool to help cover costly individuals. The GOP proposal, a central component of the latest effort to revive the party’s health care bill, has succeeded in winning over some conservatives in the House Freedom Caucus who previously opposed the legislation. But more voters across the ideological spectrum oppose the provision than support it, underscoring one reason why some mainstream Republican lawmakers have balked at the idea. Among Republicans, 48 percent oppose letting states waive protections, while 42 percent support it. Half of independent voters and 52 percent of Democrats also object to the idea. But backers of the provision say the sickest Americans would still be protected from steeper premiums as long as they do not have a gap in health coverage. And if a person with a pre-existing condition fails to maintain health insurance, supporters note, they could then obtain coverage through a high-risk pool — though experts have questioned the effectiveness of such programs. A plurality of voters (46 percent) also oppose letting states determine the benefits that insurers must cover in health plans, while 38 percent support that idea. Under the revised health bill, states would be able to apply for a waiver to opt out of certain federal insurance regulations, such as those requiring insurers to cover Obamacare’s “essential health benefits” provision, which includes coverage for hospital visits, prescription drugs and maternity care. Unlike with the issue of pre-existing conditions, viewpoints skew largely along partisan lines on who should set coverage standards for insurers: Fifty-one percent of Republicans said it should be left to the states, while 59 percent of Democrats said it should be up to the federal government. Among independents, 43 percent said it should be left to the federal government, while 37 percent said it should be left to the states. Under the proposal, states would only be able to opt out of the federal requirement on health benefits if they can prove that doing so would decrease premiums, increase enrollment and help stabilize the insurance market. While a vote on the health care bill is possible — albeit unlikely — this week, most voters want the revised bill to be reviewed by the Congressional Budget Office beforehand. Fifty-eight percent of voters said the CBO should score the legislation before any House vote, while only 16 percent said a new cost estimate is unnecessary before a vote. Despite recent changes to the GOP health care bill, its approval rating has remained constant since Speaker Paul Ryan (R-Wis.) pulled it from the House floor in late March. Forty-two percent of voters said they support the bill, up 1 point from late March. Disapproval has also declined 1 point since late March, to 37 percent. The national poll was conducted April 27-30 and consists of 1,998 registered voters. The margin of error is plus or minus 2 percentage points. See the full results here.